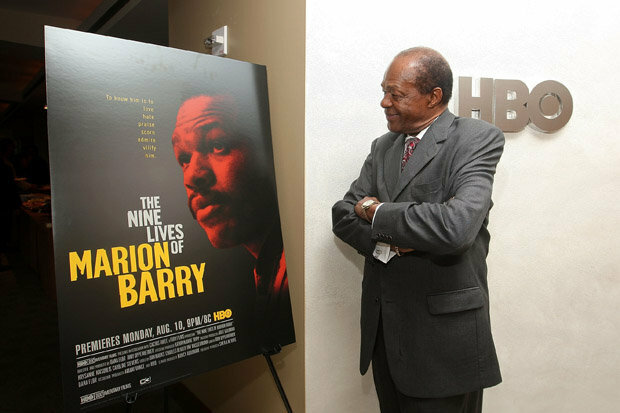 THE NINE LIVES OF MARION BARRY – TRAILER from Jimmie Lee Ward on Vimeo. DC’s 4-term Mayor Marion Barry’s footprint is everywhere in Washington, DC. U Street revival started with the Reeves Center. Marion Barry’s name is on the building. DC Commission on the Arts and Humanities started by Marion Barry. Senior services and senior housing for fixed incomes initiated by Marion Barry. The city’s first subway, Metro, dug in during the Barry years. Verizon Center. Guess who started that conversation? Conventions in Washington, DC? That came to life with a convention center. Barry. Barry identified talent. 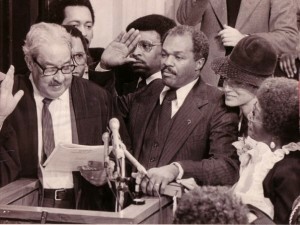 Tony Williams, who became the golden Mayor of DC, was a Barry appointee to handle the city’s budget (Williams took over when the control board was put in place). Tax incentives for first-time home owners in the district – I took advantage of that one as well as the summer jobs program for youth. The program placed us in jobs that set us on career tracks (not office day care set ups to keep us off the street). But Barry will forever be defined by his fall. Even when I was visting London, months later I was asked to explain that hotel incident and Marion Barry. “He isn’t my cousin!” I wanted to say. We were members of the same Unitarian church for a time when his fellow SNCC member and friend Rev. David H. Eaton was minister. Mayor Marion Barry, Jr., civil rights veteran, and councilmember for Ward 8, died today in Washington, DC at the age of 78. The filmmakers, who took up residency at Long Beach Island to make the film, seem keenly aware of the precarious situation that can happen at any moment to any person. Reichert remembers the family trips, holidays and vacations on Long Beach Island; Zaman is originally from Bangladesh. Long Beach Island is located along the New Jersey shore. It’s the place for summer flings and all the recreational activities that a beach community provides. In fact, before Sandy, life was a beach for many of the residents. It’s a different reality today. The people are still recovering from the hurricane damage. Resilience, which is part of a community effort, has helped them through the worst. And ironically Sandy created a bridge between some of the more affluent north island residents, and their middle class neighbors on the other end. Hurricane Sandy hit the northeastern coast including New York City with such a force, it put the whole nation on notice and exposed the vulnerability of our infrastructure in one of its most densely populated areas. The American Society of Engineers has given the U.S. an overall D+ on their infrastructure report card. They estimate that $3.6 trillion is needed for investment. If the infrastructure is weak in normal situations, what about during natural disasters. Are we ready for that? Are we “on our own”? Californians are probably the most astute people in terms of disaster preparedness. They know “The big one’s comin’” It’s just a matter of when. I have friends with barrels of supplies including canned food, some cash, and water stored without being labeled as a paranoid survivalist waiting for the apocalypse. The east coast, not so much. Some of us in the urban areas may own a shovel for snow, kitty litter, duct tape, a piggy bank full of nickels, maybe a flashlight and a few candles. It’s no accident THIS TIME NEXT YEAR was screened while down the hall was the National Building Museum’s DESIGNING FOR DISASTER exhibit. 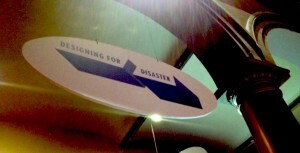 The exhibit includes objects, similations, and testimonies from major U.S. natural disasters – reminders to us all that it’s not a question of “if” but “when.” In addition to the loss of live, another tragedy is the loss of community connection. The evening couldn’t end without a word about “climate change” or the NGO’s and government’s abilities to effectively respond to persons devistated by natural disasters. During the Q&A Mangino’s FEMA and Red Cross stories resemble anyone’s encounters with relief programs and initiatives. It takes resilience to rise above it in order for a community to get through the worst. Re-building alone does not always solve the problem. Re-building brings its share of opportunists and profiteers. But the good news is there are solutions, and engineers are putting them into action in various locations. The rest may be up to the resilience of communities. But that depends on communities knowing that their infrastructure is strong, that help and support are available without the enormous hassles, and somebody really cares. 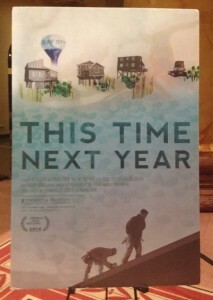 Oddly, some of the Long Beach Island residents in the film have taken on a Zen-like perspective about the impermanence of the island as sea levels continue to rise. “Will our grandchildren be able to live on Long Beach Island?” These residents may not say “climate change” in the film, but they acknowledge it for now as an almost intimate reality. Resilience may simply mean being prepared for the worst while living within the realities of the moment.